Optical Surfaces Ltd. has been selected by the Magdalena Ridge Observatory (Socorro, New Mexico, USA) to produce an ultra-stable 7.5x off-axis beam compressor that will form a key beam transfer element in the facility’s optical interferometer. When completed the Magdalena Ridge Observatory Interferometer (MROI) will be one of the world’s most powerful optical-infrared interferometers, dedicated to high resolution imaging of all types of astronomical objects. The objects that will be observed with the MROI will include many types of nearby stars, including direct observations of the radial pulsations of Cepheid variable stars and surface features on giant stars, to imaging of the brightest active galactic nuclei. 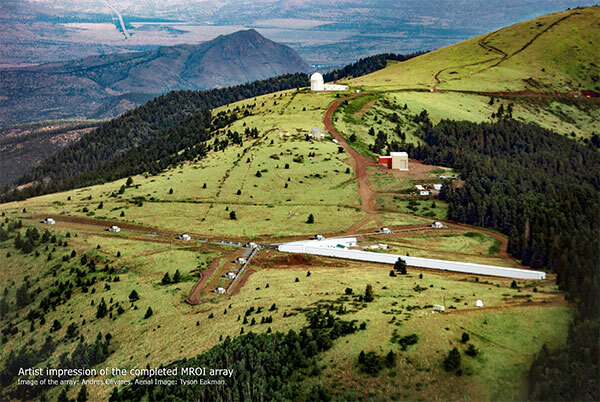 In its initial phase, the MROI will consist of three 1.4m diameter telescopes. The telescopes will be moveable between sets of discrete foundations, allowing baselines (inter-telescope spacing) between 7.5m and 347m in length. The MROI is projected to be able to produce an angular resolution of 0.6 milli-arcsecond at 1-micron wavelength. Aris Kouris, Sales Director at Optical Surfaces Ltd, commented “We are delighted to have been selected for this prestigious international astronomical project. Optical Surfaces beam compressors incorporate high precision off-axis mirrors which provide an unobstructed output and highly efficient transmission. Beam compressors are the optical tool of choice for decreasing the diameter of a collimated input beam to a smaller collimated output beam. The reflective design of our beam reducers is achromatic and with protected silver coatings can operate from VIS to far IR without adjustment. However, located at an elevation of 10,600 feet above sea level in the Magdalena Mountains, the MROI beam compressor will be subject to considerable variation in temperature. As a consequence, the design for our 7.5x beam compressor will incorporate INVAR elements tie bars to provide thermal stabilisation”. Robert Ligon, Instrument Scientist at the Magdalena Research Observatory, said “To minimize diffraction effects from long distance propagation, starlight is collimated into a 95 mm diameter beam at the telescope for propagation through most of the relay system. For further information on high precision off-axis beam compressors and beam expanders please visit https://www.optisurf.com/index.php/products/laser-beam-expanders/ or contact Optical Surfaces Ltd. on +44-208-668-6126 / sales@optisurf.com.